Confused.com has today launched an app which assesses your driving skills and scores each journey you make, and is offering cash incentives for its use. MotorMate, available free for Android and soon for iPhone, mirrors in-car telematics technology where a 'black box' is fitted to a car to monitor how it's being driven, potentially enabling insurers to set premiums according to a person's driving habits. MotorMate monitors and scores a driver based on number of journeys, distances travelled, types of roads used, speed, time of travel and levels of acceleration and braking. Each journey made while running the app is scored out of five stars and once you've driven 250 miles, an overall score is given along with feedback on how you can improve. 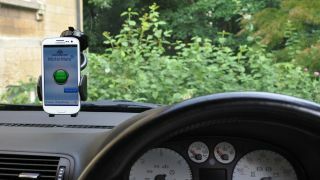 Confused.com is offering incentives to use the app: a free in-car phone cradle and charger for driving 20 miles (until 31 October), £25 cash back after driving 250 miles (until 31 October), and a further £25 cash back if users of the app buy a motor insurance policy through Confused.com (before 31 July 2012). MotorMate has been developed in partnership with The Royal Society for the Prevention of Accidents and driving technology company My Drive and allows drivers to see how they compare with RoSPA's expert drivers. Richard Jelbert, product director at MyDrive, explains: "The system works by monitoring the phone's GPS each second, continuously checking for smooth and careful driving." "As well as helping drivers become safer drivers, the Confused.com MotorMate app allows customers to try the telematics experience before having to commit," Joanne Garcia, head of emerging products at Confused.com added. "By using the app drivers can really understand how they drive and over time they can improve on their driving skills, making them a safer driver and hopefully making our roads safer too." Future versions of the app are set to include an online dashboard offering a detailed view of trips taken and driving prowess as well as social media integration, where drivers can post their scores to Twitter and Facebook. MotorMate app is available to download from Google Play now and will be available to download from the iOS App Store at the end of August.